This is by far the most memorable Earth Day of my lifetime. As we think of our roles this year to preserve and protect our planet, I can’t help to think of my beloved Uncle Ham who passed away ten days ago after a prolonged battle against cancer. At his funeral on Wednesday the speakers eulogized “Hammie” as the one who gave love to all those he knew. This is how I will always remember him – through his outward expression of joy and love and a life devoted to caring for others. My Uncle Ham also had a desire to grow plants and keep his gardens in top shape. He appreciated God’s divine handiwork in the beautiful flowering trees, honey bees and all of the fresh air present in his Asheville garden. 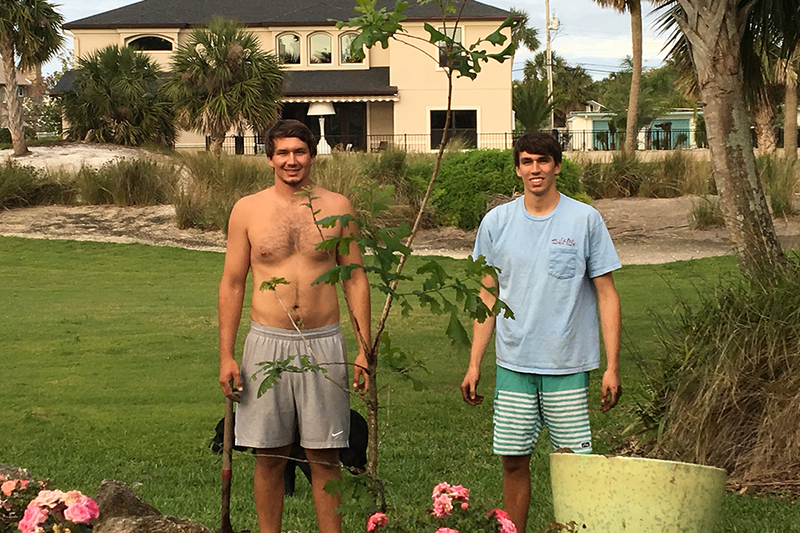 It was after these gardening stories at the celebration of his life service that I returned home to find my two sons, Will and Ben, outdoors planting a tree in our backyard. This is not just any tree, but an oak tree that Will started after placing an acorn in a small pot years earlier. We have nurtured this tree for over 10 years as we were unsure of the best spot to place it in our yard. I sat and watched them dig the hole, prepare the roots, fill and water the tree into the soil. Their planting was infused with bits of laughter between them, and I couldn’t help but think that Uncle Ham’s love for God’s creation was being passed on to my children. To me it is the simple things in life that mean the most. Taking time to appreciate all we have been given and to think of the humble beginnings from a tiny seed to a tree – a tree that will be enjoyed by future generations.